We’ve been living on our land for almost ten months now (can you believe it?!) and all we can say is WOW, what we’ve managed to accomplish is astonishing. In late winter and early spring, we did a lot of cleanup around the property and over the last ten weeks or so, we’ve completed a lot of new projects that we want to share with you. Back in winter, in the beginning of this year, we decided to slow down a bit and in doing so, we decided to try our hand at a garden. We brought in some topsoil and compost, and then collected pine needles from the forest for our mulch. So far, it does seem that the mulch keeps the soil much more moist but not as moist as we would like. Either way, mulch is better than no mulch! Read our full blog post on how we are amending our clay soil. Adding pine mulch to the garden for soil protection and water retention… oh yea, it will decompose over time, too. One our raised garden beds were good to go, we decided to go crazy with seeds! Read our post on our no-cares given approach to starting our garden. We planted a little bit of everything to see what would sprout including tomatoes, lettuce, green onions, onions, potatoes, chard, beets, peppers, snap peas and more. So far, it seems that the cat digs up most of the seedlings and many things never sprouted at all. Here are a few pictures of what has been doing well up until this point. We planted a bunch of beet seeds and three plants total are doing well. 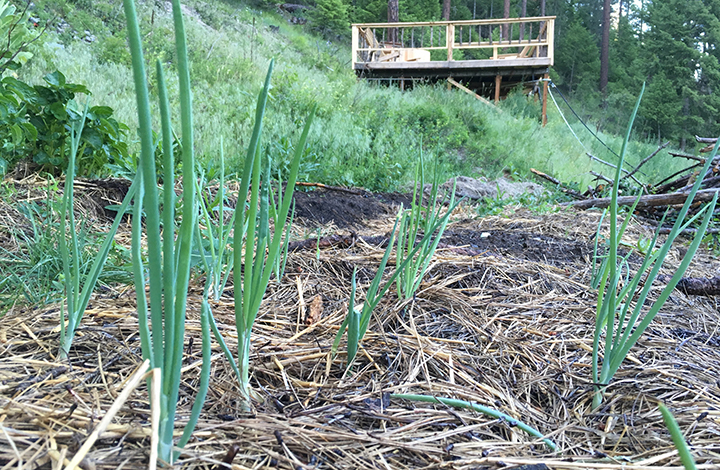 Our onions went crazy one day one but their progress seems to be slowing. Apparently Idaho IS the potato state… they are the only things THRIVING in our garden and we have no idea why! Go potatoes! We planted a bunch of carrots but two seeds sprouted. We hope we get at least two carrots out of the garden this year! The biggest project we’ve worked on since we’ve arrived on our property is the building of our hot tub deck. This was an important project for us to validate that we could make lumber with an Alaskan chainsaw mill and then build with it. WE learned a lot of new skills, learned how to work with one another, and now we have a place to invite neighbors over for beverages or BBQs. We are SO HAPPY this is done, and we feel pride every single day when we look at it. These past couple of months in particular we use our Granberg mini mill to create 4×4 posts for the railing, built the stairs, and also finished the railing where we put our leftover tree branches to use as banisters. Before the heat of summer (or spring?) hit, we wanted to get any burning done on the property. We waited for the rain to get this done. Since we arrived on our property, we’ve accumulated quite the scrap pile of unusable or rotten lumber as well as unusable branches from the trees we fell last fall. We made a pile of the usable branches and burned the rest. We had quite the bonfire for two different nights! We had to sort through this mess to create a “to use” pile and a “to burn” pile. Our bonfire! Get those unusable scraps outta here! One of the things we did for peace-of-mind was install a door lock on our cabin. Yes, this is to keep honest people honest, but it was a small project we completed nonetheless. Click here to watch a fun video of this installation! Our new door lock! Jesse had fun locking me out of the cabin for a short while, until he gave me my own secret code! When we were out and about picking up our IBC tank, we ran into a guy that had a worm farm! He volunteered to send us home with a small bucket of red wigglers and we gladly took him up on the offer. We now have our own tiny worm farm and have another use for some of our leftover veggie and paper scraps! So far, so good, and we are so exited to use the castings and worm tea in our garden at some point. Hopefully we can scale our farm over time. This awesome guy gave us a bucket of red wigglers! We are so thankful! We hope to do a full post on our off grid water solution soon, but we’ll give you an overview. We basically bought an IBC tank as well as a 625-gallon cistern to put on the top of our hill, and we’re able to pump water from the IBC tank to the cistern. We weren’t planning on having this set up so quickly, but our hot tub catapulted us into making this happen, and we also wanted extra water on hand for potential fire fighting. We will need a different solution for this winter so hopefully we can get that done over the next four months or so. Another thing we hope to elaborate on soon is how we were able to find a Fisher wood stove for $100 and restore it to a like-new condition! Well, not like-new, but it looks pretty good! Even though winter is far away, it will come quick, and we already know that we don’t want to do another winter with our existing wood stove (last winter was somewhat rough). We jumped on this opportunity immediately even when we had other projects we would have rather been working on. Stay tuned for how we did this. In the meantime, here are the ways we find tools and materials for great prices. You should’ve seen the “before” photo! What a difference a little TLC makes! Because we were on a roll with getting the hot tub deck usable, we decided to make some garnishings out of scrap wood we had laying around. Some of the things we built included a set of four chairs, two tables, railing for the deck, stairs to the deck and even a cute little bird house. 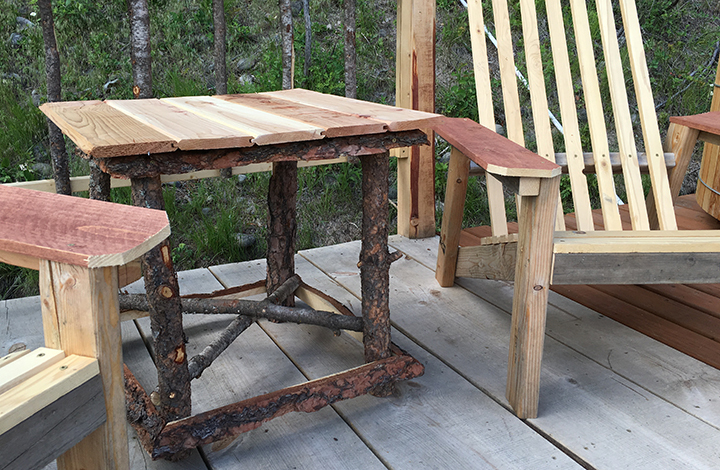 See our post on scrap wood projects around the homestead. Aren’t these rustic-looking and incredibly appropriate for our deck? The most satisfying thing we accomplished in this time frame was the finishing of our DIY wood fired hot tub. Be sure to check our multi-part video series on how we were able to build this for about $850. Our first soak was incredibly satisfying, and so far we’ve fired up the tub eight consecutive nights in a row! Here is the end of the project! Isn’t she a beauty? Having our hot tub done is great for our souls. Because believe it or not we DO wish to start on our barn as soon as humanly possible (our lives our quite busy and we have a lot going on that we don’t share on the blog), we decided to get started with a concrete project. Neither of us have worked with concrete before so we poured a couple of slabs. They turned out great, and we’ve already learned a few lessons about what NOT to do! Read our post on our first concrete projects. In between all of this, we survived our first hot streak (95 degrees on our property in full sun with ZERO shade) so we ordered some books and got to reading. Some of these we read cover to cover, others are still waiting to be read. One book at a time, we’re gaining the knowledge we need to start our barn although at some point the reading will need to stop and practice will need to take over. True story… I read this cover-to-cover. I learned a lot, but a lot of the vocabulary wasn’t new as Jesse has been a great instructor! In all honesty, I’m not sure exactly what we will get done the remainder of summer. 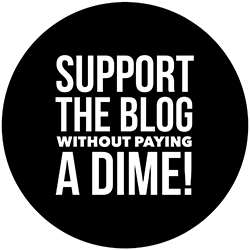 We have spent so much money over the past few months that we need to let our bank account recover a bit, we have family coming to visit us here and there, we have to check back in on our online businesses at some point, and we have a few other personal loose ends we’d like to tie up before taking on any more large projects. We will continue to wrap up small projects here and there but one secret I want to let you in on if you’ve made it this far is that we have the beginning of our solar power system in the mail as we speak! Can’t wait to share the details with you. Here’s to another few great months on our off grid homestead! Really enjoyed the update today (6/28/2016). You did a great job cleaning-up that stove! I’ve been curious and now my curiosity has got the better of me – why are you not using treated wood for your outdoor projects? Non treated wood has a short lifespan outdoors. I’m also curious about your home-based business since I’m nearing the early retirement age but yet want to stay active and not in an 8-5 world. The short description of what I do is: computer programmer. I sense what you do is with computers. Glad you enjoyed the update, and yes the stove cleaned up better than we had hoped for! We aren’t using treated wood because that isn’t what we have on our property. The idea is not to use money to solve every problem but instead, the materials that we have available to us. We use fir for the structural things, and used cedar for our hot tub and hand railing of the deck, but we chose to use untreated pine for some things because the tree was on our property. Back in the day, treated lumber as we know it today didn’t exist and people built structures just fine. A short lifespan is relative…. if our decking is bad with time, it’s easy to replace as trees are renewable. Thanks for the tips – we’re very new gardeners so we’re thankful for those that have knowledge in this area! Hopefully we’ll get a great harvest of the crops you mentioned with patience, love and a little luck! Hi, I’m really enjoying watching your progress. I’m surprised that you haven’t dug a well yet. We’re building a log home on 20 acres in South/Central Oregon and the very first thing we did was drill a well because so many other projects depend on a ready source of water. Also, the whole project depends on water. If there was not a viable water source the location would not work for our retirement home. We moved from Southern Oregon (lived everywhere from Medford to Roseburg) so we’re familiar with the area! It is beautiful – sounds like a fun project! Hey just wanted you to know I have had a lot of success bucket gardening. Carrots are awesome and keep well even in winter. Radishes too! Don’t give up….love your tenacity for a different way of life! Try this in the vegie garden . Clear the pine needles off the top of a square yard or so. let sit in the sun for a couple of days . plant some samples of all you want to grow . keep moist ,Watch and learn . You seem determined to remove my posts . Your perogative I suppose but after watching this site for 3 weeks I find it unlikely you put in 40 hours a week on it . Cant see any change in the past fortnight except my posts are removed . What gives ? don’t want them? Hi Alyssa, I love it that you are real and share your mess-ups (garden) as well as success stories (gorgeous hot tub deck). With your persistence and energy, I know you’ll get the hang of it eventually. I’m down the same path and currently reading all I can get my hands on about gardening. There’s so much great information out there! Right now I’m reading The Backyard Homestead and loving it.